The Mondo Spider Project was founded by five Vancouverites: Charlie Brinson, Dillard Brinson, Alex Mossman, Leigh Christie and Jonathan Tippett. Inspired by the famous TV shows Scrapheap Challenge and Junkyard Wars USA, Alex Mossman, Brian Wells and several other brilliant local Vancouver Engineers started a competition known as The Vancouver Junkyard Wars (VJYW). In 2005, the competition was to be a “walking machine” race. Jonathan, Leigh and Charlie had all participated in the VJYW in the past, and in 2005 they formed a team together along with Alex. Leigh Christie brought a crew of participants together. The final team roster included: Jimmy Koo, Charlie Brinson, Alex Mossman, Jonathan Tippett, Bradley Buss, Matt Chudleigh, Josh Vines, Emerson Gallagher, Ryan Johnston, and Vince Augustine. This combined team took an overly ambitious approach to the design challenge. While a machine with a very small step would have been the smart thing to do, this team of lunatics saw it as an opportunity to make a mechanical beast! A more impressive and aesthetically pleasing leg mechanism would have to be found. Alex found a website called www.mechanicalspider.com. On this site he found a 6-bar linkage mechanism that had been patented by Joe Klann. The linkage mechanism produced a relatively flat foot path and a tall step height. It appeared to be exactly what they were looking for. The competition took place over the course of a weekend. 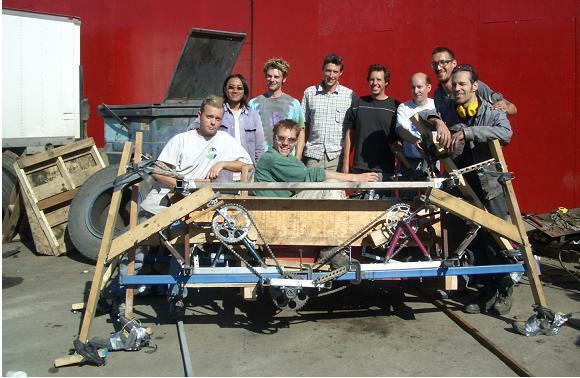 Within 48 hours, the team had built a walking machine with 8 of the bizarre six-bar linkage legs made of wood. At the final minute, some key changes were made to the machine. And with a grand total of 10 seconds of test time, the race began… And the machine walked! Unfortunately after 20 steps, the spider began to hobble, and then crawl, and then die. After the competition, the carcass of the spider was thrown in a recycling bin. The pictures are from the prototype walking machine. Due to obvious time constraints, little attention was paid to aesthetics. 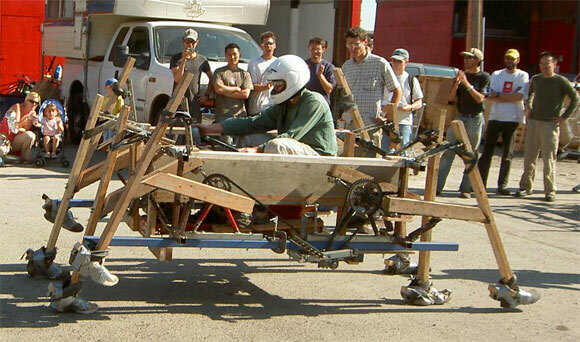 The machine was built entirely from scrap parts found at local junkyards, and while being a proof of concept, was consequently not the most reliable vehicle. Many of the original Junk Yard Wars team went on to work on what was soon to be named the Mondo Spider project. A few weeks later, after nearly recovering from the blitzkrieg-like JYW competition, Charlie, Leigh, Jonathan and Alex were haunted by memories of their beloved but ultimately dead junk spider. Charlie took it upon himself to show with calculations that this mechanical beast could be built, and that the forces and torques involved were manageable. Using Matlab, CAD software and Excel the basic proof was laid before the team. These calculations served as a guide for the design of the entire machine. The funding was approved. Suddenly, with this influx of credibility and expectations, the whole team was becoming re-energized. Over the next several months, the Charlie and Leigh recruited the old VJYW crew back to build what was now being called the Mondo Spider. Word of mouth led to many other brilliant fabricators, welders, machinists, engineers and artists joining the project. These volunteers would ultimately help to design, part-source, build, assemble, test, (and fix) the spider over the next 7 months. After the overall architecture was hashed out by all five founders, the specific solid modeling began. The entire design was modeled using CAD software. The frame was modeled by Leigh Christie. The power pack was designed by Alex Mossman and the legs were drawn up by Jonathan Tippett. Charlie managed and coordinated the team for the spiders construction. With the official Burning Man backing, the Mondo Spider needed a spider lair for its construction. A space in Burnaby was rented for the manufacturing of the leg parts. In total there were 200 individual mild steel components to be manufactured for the legs. Charlie Brinson and Leigh Christie worked around the clock to co-ordinate and manage a team of dedicated volunteers for the manufacturing process. Once these parts were finished, the welding and assembly effort commenced. Under the co-ordination of leg designer and “Team Leg” leader, Jonathan Tippett, a crack-team of skilled TIG welders (mainly Ryan Johnston, Sam Mayer) worked day and night in the Industrialus shop (now dubbed “The Leg Lair”) to combine the leg parts into robust linkages that were previously just a CAD dream. With only a month remaining before Burning Man, The Mondo Spider still lacked a lair that could be used for assembly and the remaining frame construction. Fortunately, along came Rob Cunningham. With his donation, a space at the Great Northern Way campus was obtained. Finally the spider could come to life. Within a couple weeks the spider was fully built and assembled. Initial testing was on jacks… The leg “flailing” test as it was called. Unfortunately, time had run out. The unveiling was less than a day away. Knowing full well that nothing ever works properly the first time it is tested… the whole team was nervous. Several months after the creation of the Mondo Spider, the core artists joined forces to help create the eatART Laboratory.